By Tina Spencer, M.S., and Lee Anne Sulzberger, M.Ed. Co-teaching is one option for delivering special education services to students with disabilities in general education classes (Friend, 2007). Within this model, two or more professionals deliver content grounded in purposeful instructional intensity to a diverse group of students in the same classroom. Co-teaching partners can help meet the varying learning needs of students in their classes by adopting the principles of differentiated instruction. Tomlinson and Imbeau (2010) describe differentiation as an instructional approach that “results from an ongoing process of trial, reflection, and adjustment to the classroom itself” (p. 13). When teachers differentiate instruction for students, they provide multiple ways for students to (a) access critical content, (b) make sense of that content, and (c) express what they have learned about that content (i.e., differentiation of content, process, and product). Table 1 lists examples of what can and cannot be differentiated in a specific unit of instruction. 5.4 How can students continue to build vocabulary by applying their knowledge of word structure and context clues to determine the meanings of unfamiliar words? Adapted from Glass (2012, December). learning profiles that are influenced by factors such as learning style, gender, and culture (Tomlinson & Imbeau, 2010, Chapter 1). Once co-teaching partners have decided to incorporate differentiated instruction, they must determine what students should know and be able to do by the end of each lesson. One useful tool in determining critical content is the Planning Pyramid (Schumm, Vaughn, & Leavell, 1994). 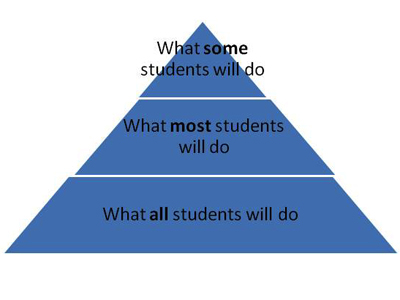 Using the Planning Pyramid as a guide, co-teachers determine what all students must do, what most students will do, and what some students will do (see Figure 2). General educator: What three things do ALL students need to be able to do by the end of this class? Would you be satisfied if each task looked different? What is critical for students to know and be able to do? Special educator: What must be done for the students with disabilities so they can do what you have agreed is essential for ALL students? This process helps ensure that both teachers agree upon and understand the critical content students must learn and what must be done for students with disabilities so they can master that content. One of the essential features of differentiated instruction is the use of formative or ongoing assessment to guide instruction. In Differentiation Central’s (2010b) online video Effective Instruction Begins with Pre-Assessing the Students, Brighton shares how formative assessments can give teachers a road map to differentiated instruction within the classroom. She provides guidelines to check for student knowledge, understanding, and skills without always using paper and pencil tests and quizzes. Differentiation Central’s (2010a) Daily Assessment Serves as a Compass for Next Steps in the Classroom highlights the use of exit cards and behavior checklists, two simple formative assessment strategies that teachers may wish to use. Gravois and Gickling (2002) have created a six-step process designed to help teachers move students forward in their learning. The process, outlined below, assesses what students know, how they think, and what they can do. Select material for instruction at student’s instructional level. Develop a relationship with the student. Assess the student’s prior knowledge, word recognition, and comprehension. Match instruction to student needs. Teach on student’s instructional level (i.e., provide direct instruction and remedial strategies through co-teaching variations). Use data on an ongoing basis to evaluate student progress. Grouping and regrouping students through frequent use of assessment data provides opportunities for quality instruction. Valentino (2000) observed that “teachers are discovering that informally grouping and regrouping students in a variety of ways throughout the school day can make a teacher's job easier and students more productive. This teaching strategy is called flexible grouping” (para. 2). Ford (2005) suggests the following steps when creating flexible student groups for reading instruction. The steps can easily be applied to other content areas. Select text with a common element, written at multiple instructional levels. Match text to individual students. Differentiate engaging activities within each group but hold the same expectations for all students. Assess several times within a given reading unit whether standards are being met. Use assessment data to dissolve and form new groups of students. Flexible groups help students practice content in a variety of ways throughout a unit. Students can work together according to similar interests, as partners, or in small groups needing to learn specific skills. Because students learn content at different rates, flexible groups should change as often as formative assessments determine there is a need to regroup students. As they plan learning activities, it is important that co-teachers select instructional strategies that have demonstrated success. Instructional strategies are specific approaches teachers use to ensure successful outcomes for student learning. Further, Dean, Hubbell, Pitler, and Stone (2012) note that cues, questions, advance organizers, and nonlinguistic representations are among the effective strategies to help students develop an understanding of new material. The general education teacher tells the objective of the day’s lesson and the special education teacher shows a road map of the class as an advance organizer. The general education teacher explains the key characteristics of plant cells and animal cells. The special educator models the use of a Venn diagram (i.e., nonlinguistic representation) by sorting the characteristics presented by the general education teacher. The general education teacher checks for understanding by asking students to hold up cards that say “animal cell” or “plant cell” as the teacher states different characteristics. Following the card activity, both teachers discuss the characteristics with the students. They then place the students in cooperative learning groups based on student readiness levels. The students complete a Venn diagram showing the similarities and differences between plant and animal cells. As a scaffolded assignment, some of the students who have difficulty writing may contribute to their group members by using nonlinguistic representations such as pictures or shapes for the characteristics. Once the diagram is complete, the students will make group presentations. They will have a choice of presenting by writing summary paragraphs and reading their finished product to the class, creating a video presentation such as a podcast, or designing a PowerPoint presentation. While students are working on the assignment, the teachers walk around the room asking students specific questions about the task, as well as clarifying and reinforcing effort for students who may be struggling with the activity. The teachers give feedback to the students as they work to complete their graphic organizers and other products that demonstrate understanding and skill mastery. As co-teaching partners identify the instructional strategies they will use, they also determine which co-teaching variations will best meet the learning objectives for the lesson. Table 2, excerpted from the College of William and Mary’s Training and Technical Assistance Center (T/TAC W&M) Considerations Packet on co-teaching, describes common variations and the amount of planning time needed to prepare a lesson using that variation. An example of classroom use is also provided. Directions for ordering this Considerations Packet and others may be found under Additional Resources at the end of this article. Teachers alternate roles of teaching lessons and observing students for an understanding of academic and social functioning. A general educator teaches a whole-group lesson on writing complete sentences. The special educator collects data related to a single student or small groups of students. The data are used to compare targeted student behavior to the behavior of others during the lesson being taught. In future lessons, they may reverse roles when specific behaviors need to be observed. Teachers alternate roles of teaching and supporting the instructional process. A general educator teaches a whole-group lesson on the causes of the Civil War. The special educator walks around the classroom to assist students by answering individual questions or to redirect students who are not following the instruction. In future lessons, they may reverse roles. Small groups of students rotate to various stations for instruction, review, and/or practice. A specialist works with a small group of students on prewriting, while other students are working with the general educator on research skills. Yet another group of students is using the classroom computer to research a topic. Over the course of the week, all students work at each task/station. Students are divided into mixed-ability groups, and each co-teaching partner teaches the same material to one of the groups. The class is divided in half, and each teacher works with a group on creating a timeline of important events in history. At the end of the session, each group shares its timeline and reviews important concepts. Teachers alternate roles of presenting, reviewing, and monitoring instruction. A general educator and specialist teach a whole-group lesson on fractions. The specialist reviews the previous lesson and the general educator introduces the concept and provides initial instruction. The special educator directs the guided practice and both supervise peer practice and conduct evaluation. In future lessons, the partners may reverse roles. One person teaches, reteaches, or enriches a concept for a small group, while the other monitors or teaches the remaining class members. The specialist works with a small group of students on an enrichment project, while the general educator teaches the remainder of the students. Adapted from Interactions Collaboration Skills for School Professionals, by M. Friend & L. Cook, 2007, Boston, MA: Pearson Education. Co-teachers can create powerful instruction in their diverse classes by differentiating instruction and focusing on the three elements of ongoing assessment, flexible grouping, and use of research-based instructional strategies. Read “Designing the IEP: Measuring and Reporting Progress toward Mastery of Annual Goals” in this issue of Link Lines to learn more about monitoring progress for students with disabilities. For more information on differentiating instruction, order the T/TAC W&M Considerations Packets Differentiating for Success in Inclusive Classrooms. To learn more about the instructional assessment, consult the Considerations Packet “Instruction Assessment: An Essential Tool for Designing Effective Instruction” or read KIDTAP: A Strengths-Based Approach to Curriculum-Based Assessment in the February/March 2004 issue of Link Lines. Dieker, L. (2012, October). Differentiation in co-taught classrooms: Current and future technologies and strategies. Keynote address presented at the 23rd Annual Symposium on Collaboration and Inclusive Education sponsored by the College of William and Mary, Williamsburg, VA.
Ford, M. P. (2005). Differentiation through flexible grouping: Successfully reaching all readers (Government Contract No. ED-01-CO-0011). Naperville, IL: Learning Point Associates. Friend, M. (2007, January & March). Collaborating for success. Presentation at workshop for VASSP/VSFEL in collaboration with Virginia DOE and The College of William and Mary, Richmond, VA.
(5th ed.). Boston, MA: Pearson Education. Glass, K., (2012, December). Differentiated instruction aligned to the ELA common core standards. Session presented at the 2012 Learning Forward Annual Conference, Boston. Gravois, T., & Gickling, E. (2002). Best practices in curriculum-based assessment. In A. Thomas & J. Grimes (Eds. ), Best practices in school psychology (pp.1-13). Washington, DC: National Association of School Psychologists. Knight, J. (2013). High-impact instruction: A framework for great teaching. Thousand Oaks: Corwin. Tomlinson, C. A., & Imbeau, M. B. (2010). 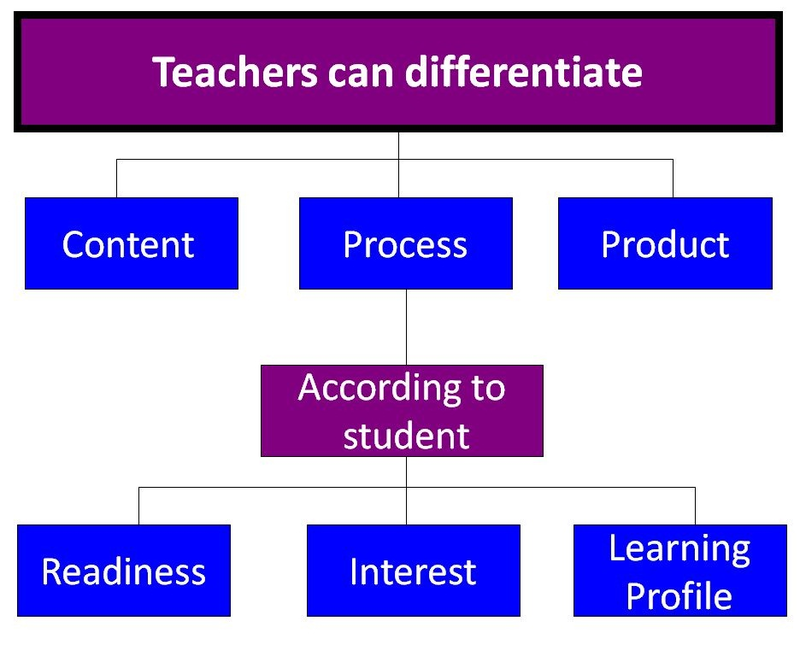 Leading and managing a differentiated classroom. Alexandria, VA: Association for Supervision and Curriculum Development.